It has recently come to my attention that my writing has improved since I started my series eight years ago. As a result, I am planning to release second editions of my series in the near future. I have consulted my production team and they said that these new editions will have new cover designs and be produced from a different publisher. I already got started and have edited the first two chapters of my first volume. I am very pleased with the results and look forward to continue working on this new project. I will keep you posted. I have exciting news! As a result of WonderCon, I have acquired a partnership with a high school in Pomona that will make my book signing at WonderCon 2016 even bigger than this year! With the resources they will be providing, they plan to include more marketing materials apart from fliers, book marks, and posters. These new marketing materials will consist of buttons with character faces on them and art work of the characters to sell in addition to my books. They will also have more personnel who will assist me throughout the convention. I am currently on the look out for when the application for WonderCon 2016 will be available. I will keep you updated on further developments. Wish me luck! I have been offered the chance to have another book signing in a small convention that will be held at the Tustin Public Library, which will feature several artists and writers. Nothing is certain at this point, but the library is asking permission to host the event. Once they receive confirmation, they will let me know if a spot will be open. This year has become a VERY eventful year for my writing. Had my third volume published, did WonderCon, preparing my first short story, and now this. I will keep you all updated on any further developments. Wish me luck! I have spent my entire writing career creating stories about superheroes performing good deeds and saving lives, but this time, I actually got to just that yesterday. 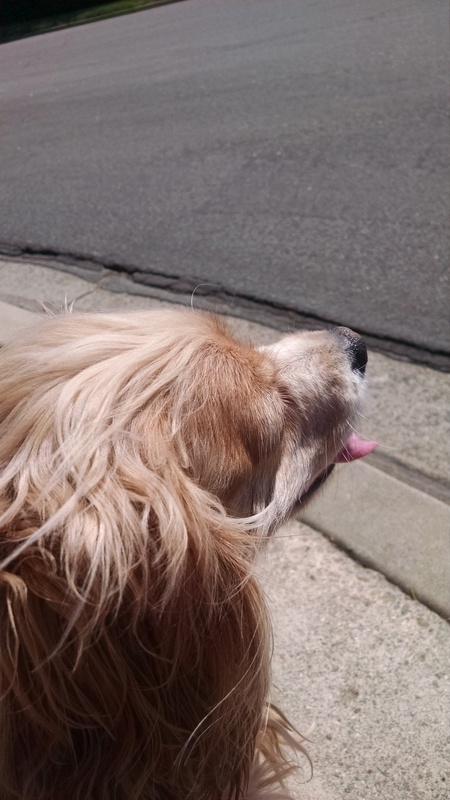 I was about to drive out of my neighborhood when I found a stray dog wandering around. I stopped the car, caught up with the dog, and called its owner through its license. The owner found me and I was able to return the dog. After the deed was done, I finally got to feel the satisfaction of doing a good deed for a fellow human being and a helpless animal. It was during this ordeal that I understood that writing about people doing good deeds for the public is one thing, but to actually do it in real life is something else entirely. When you write such as event, you are basing what you imagine the character would feel during that situation. However, when you perform something good in the real world, you feel and understand the emotions that occur throughout the event. Ever since I adopted my American Pit Bull Terrier, Fitch, I have been thinking of basing a character or even a species of creature off of him. I admire the broad and powerful musculature of a pit bull because it symbolizes that they are strong and reliable as a grass-fed ox when properly trained. 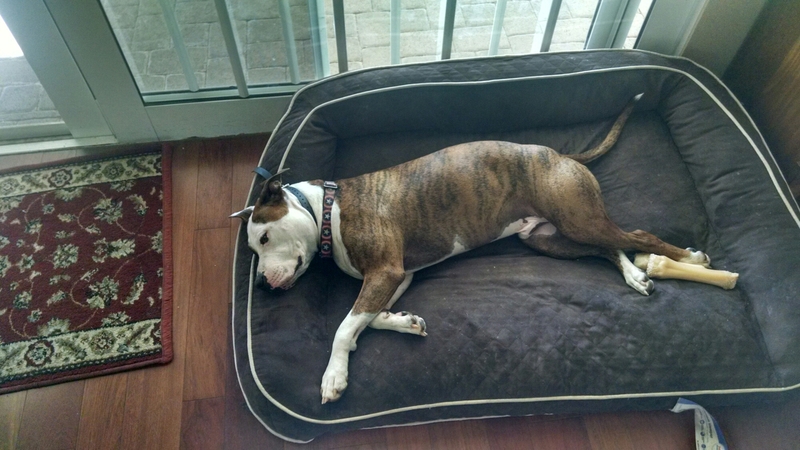 Fitch’s brindle coat, which is dark brown with black stripes, is both exotic and shiny, which signifies that pit bulls have a beauty to them. The way Fitch walks is determined and he always strides right next to me wherever I go, which demonstrates his loyalty and love. Finally, Fitch’s light brown eyes expresses a deep innocence and love that only special creatures can exhibit. If I was to base a creature off of Fitch, I would make one that embodies an elegant balance between ferocity, beauty, and cuteness. I can already picture what this animal will look like compared to Fitch and I look forward to it to make an appearance in my fifth volume. I recently had an idea for my short story sub-series. In addition to writing three short stories to introduce characters who will appear in my upcoming fourth volume, I am also planning to write a short story that will revolve around the origins of the main villain of the entire series, Vogan. By creating an origin story for the main villain, everyone will gain a certain insight on how Vogan operates and why he is pursuing his goals. I already have many ideas of what to include and I look forward to working on it. I have been working on the first chapter of the new short story and I managed to illustrate the origins of the supervillain. Also, this chapter will tie in to characters from the first and third volumes of my series. In addition, the origins of the technology that created Cyber Shadow will be revealed. I look forward to where this will lead and I will keep you updated on any further developments.